Don’t worry, our dirt is clean! 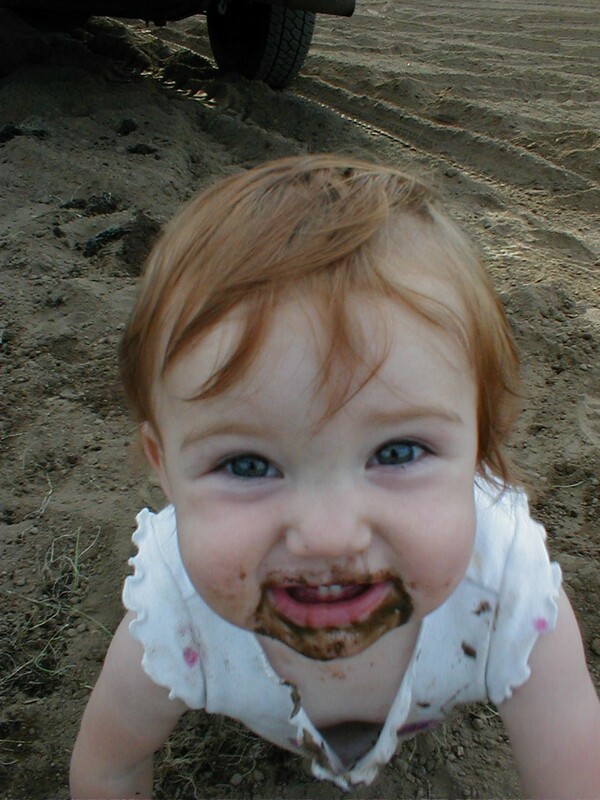 When Della was a baby, she loved to eat dirt. I didn’t worry because I knew there were no chemicals in it. We believe that freshness is the key to quality food, and that to be truly fresh, the farm where the food is grown has to be no more than half a day from its ultimate destination. We harvest delicate crops only in the cool parts of the day, then put them in the moist cooler so they stay fresh. Even though the lettuce is no longer attached to its roots, and the bean is no longer attached to its mother plant, they are still alive and breathing. Plant metabolism slows dramatically when the plant is cool, so this resting period is the best time to harvest. We grow everything organically, but we can’t say so because we’re not certified by the USDA. But what’s really important is our belief that growing organically is the best thing to do, for our farm and for our customers. We refrain from using synthetic pesticides, herbicides, and fertilizers because we find that if things are taken care of properly, there is rarely a need for such measures. Manures, compost, and other organic fertilizers feed the soil, and the healthy soil takes care of the rest. Why would we want to add anything toxic to the food that we feed our family, and yours? Good read…I loved to eat dirt as a child. On a serious not my father loved to garden. It’s nice to know we have a trusted local farmer we can get fresh organically grown produce. I could care less about the USDA stamp because. Thanks for letting us visit your farm and witness your growing process. You’re make organically grown produce affordable for the masses. We all deserve chemical free produce.